Back in the 1990s, animal mascots were all the rage in video games. Sonic the Hedgehog was a wild success, even surpassing Mario’s popularity for a time. But while Sonic may have been way past cool, he inspired just about every developer to try their hand at an “animal with attitude” character, in hopes of replicating his success, with mostly disappointing results. Most of the would-be mascots inspired in Sonic’s wake were uninspired, forced, and quickly forgotten. 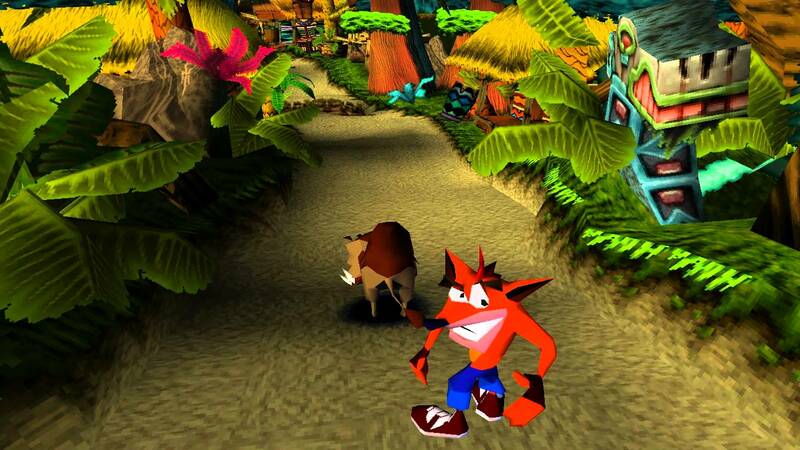 One exception, however, was 1996’s Crash Bandicoot, created by Naughty Dog. Crash not only became popular, he was even seen as the unofficial face of the Sony Playstation for a time. Crash was successful enough to start a franchise and put Naughty Dog on the map. Unfortunately for Crash, his debut outing has suffered the effects of time, with many of its elements showing their age in prominent ways. Crash Bandicoot is a 2.5D platformer, with 3D characters and environments, and a mostly 3D perspective, but Crash moves in a fixed path. It was more of an attempt at creating a 2D platformer from a 3D point of view, as opposed to a open 3D platormer like Super Mario 64, released the very same year as Crash. Nor was Crash’s moveset as versatile as Mario’s. Crash can jump and perform a spin attack to wipe out enemies. A tiki mask named Aku Aku works as the game’s sole power-up (found in some of the game’s many breakable crates), and can be stacked up to three times (the first two work like shields to make Crash more durable, while a third Aku Aku grants temporary invincibility). Additionally, Wumpa Fruits work like Mario’s coins or DK’s bananas, with an extra life granted for every one-hundred you can nab. 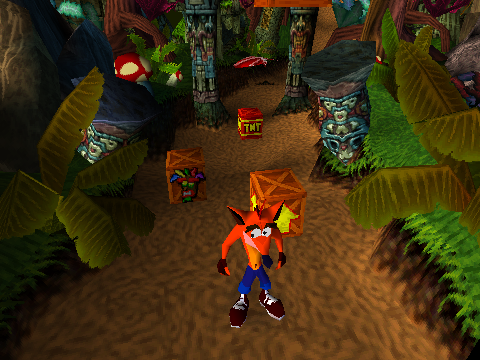 The story served as a means to introduce Crash Bandicoot to the world. The mad scientist Dr. Neo Cortex is experimenting on animals, forcefully evolving them to create an army of animal soldiers to take over the world. Crash is an evolved bandicoot from these experiments, but ends up rebelling against the mad doctor. Crash manages to escape Cortex’s lab, but ends up on a far off island. 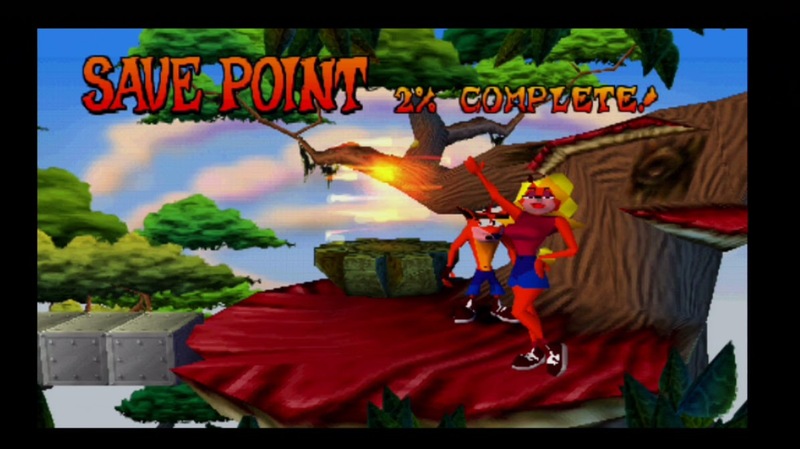 With Crash’s girlfriend Tawna still in the hands of Cortex, Crash sets out to save her. The plot really is inconsequential, but it does try to give the characters some fun, cartoony personalities, though those personalities didn’t truly shine through until the sequels. Crash Bandicoot’s level design provides a handful of fun stages, but a lot of them can feel rather bland. The levels themselves can sometimes prove difficult, though you’ll probably lose more lives due to the fixed camera work, which is so focused on Crash himself that you can’t always make out the distances in jumps and the placements of objects and traps. Crash’s less-than ideal jumping physics don’t exactly help, either. There are a few boss fights found in between some of the game’s thirty-two stages, but they end up being rather dull and easy. You may struggle to get to these boss encounters, only to feel the payoff wasn’t worth it. The worst aspect of this original Crash Bandicoot, however, is the awkward save feature. In a baffling design decision, the primary means of saving is by completing certain bonus stages, which are unlocked in certain levels by obtaining three token’s shaped like Tawna’s mug (tokens shaped like the villain’s faces also appear in certain stages with bonuses of their own). But even if you manage to get to Tawna’s bonus round you can miss the chance to save if you die in the bonus round, and you can’t redo these bonuses again in the same playthrough. The only other method of saving is by collecting gems. Gems are secret items that are earned by destroying every crate in a stage without dying. That might not sound too difficult, except that some crates are hidden, and there’s no way of knowing how many you missed unless you’ve completed the level without dying. 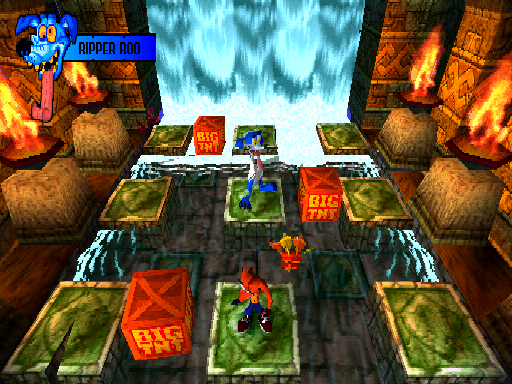 Worse still, much of the game’s difficulty stems from trial-and-error, and you often have to lose a few times in order to memorize a stage’s layout. This convoluted save feature often means you’ll go through several levels without a chance to save, making game overs feel like a crushing blow as you have to redo much of your progress. You can always quit the stage and start over (being forced to sit through more load times) to reset any possible deaths, or come back and try a level again later, but asking players to jump through so many hoops just to get the opportunity to save the game is beyond outrageous. The ability save should just be included at all times or by reaching certain points and clearing certain levels. Saving your progress shouldn’t be an optional reward. Still, there is some fun to be had with Crash Bandicoot, but it all only goes so far: The simple gameplay works well enough (though this too would be refined in the sequels). The graphics, while aged, at least show off the game’s sense of humor (Crash’s death animations provide Looney Tunes-style slapstick). The music is fun if maybe not entirely memorable. And every now and again you’ll come across a solidly fun stage. The sad thing is most of the game’s best bits feel mediocre when compared to both today’s standards and the better platformers of the time (not only was Mario 64 released the same year, but Sega’s Nights Into Dreams as well). The worst aspects of Crash Bandicoot – namely the dumbfounding save feature – have only devolved all the more with time. Crash Bandicoot may have created a star out of its titular hero, but the framework was bettered by the two succeeding games in the series by some margin. The original may have laid the groundwork for the sequels to justify Crash Bandicoot’s popularity in the 1990s, but the sad truth is the original title may be better left to memories. I got a lot of stick for saying Crash didn’t hold up as people would like to think. You’re right, the camera was atrocious in places, and the levels never really changed.